E.P.O.S. Interface. Fixed a error when open a EPOS template file. In the main menu file now you can open the project folder. Changed the drawing width of the booms. Now it use allways the width from the crane editor. Added canvas lock for the crane property editor combo boxes. In the crane edit load chart you can now paste from Excel documents. Added in the menu Options/Settings... a default used font size. In the 'Object overview' and in the object selection added a search editbox to filter the display list. When you install a crane the import window shows now more information that it don't looks like that the application is frozen. In the print preview added a 'Copy to clipboard' function to the toolbar. With this function you can copy the current view in the clipboard and insert it in other application, maybe in a office application where you can create a lifting documentation. In the measurements view now you can draw items and place text. Added a language editor in the main menu language. Added 'My document folder' in the main menu Tools. This opens the file explorer from in the options specified folder. The old chm based help is replaced with an interactive help system. In the tab 'Project folder' added a search edit box. When a new kranXpert version is available then a update button is displayed. The webbrowser supports interactive help actions and file import. Added a new tool to create from the webbrowser view a screenshot. You can now create subfolders in the favorites. We added also drag/drop support to move favorites or to create new favorites. Added to the toolbar 'Install/Upgrade' to install objects form the web. Changed from edit boxes and combo boxes to an object inspector view. The zoom factor changed from 5m to 2m. With pressed ctrl key the zoom is changed by factor 10, thats mean you are zooming 20m steps. When you select a drawing element in the planner, then in the right side are showing the editable object propertys (no double click anymore). Added new drawing item propery 'Locked'. Locked items can't be moved or deleted. When you select a locked item the grip is showing a locked symbol. Added to the dimensioning drawing item a color propery. Drawing item text and dimensioning have now changeable font size propertys. To draw a drawing element you have used click/move/click, now also the method mouse down/move/mouse up is supported. Added a new drawing tool add image. With that tool you can insert images to the planner and set margins and dimensions to the picture like in the groundplan picture. The helping view in the front, left and top view is now not expanded per default. Fixed bug at rigging with 4 attempts and a cylinder load type. Add to the dropdown of the panorama picture selection a new menu to open the picture folder. Here you can add own panorama images (only jpg files are supported). Add new button to the toolbar to change the visibility of the ruler. The duty load charts print output is now better. The grips of the drawing items are changed (white border). The modal terrain setting window is now integraded in the right side of the planner. The printer output is changed. In the print preview are more settings to customize the output. Added changeable print footer to the planner. Add new button to duplicate the selected object. In the edit groundplan picture window added a save image as PNG file button. Fixed problem: Now at closed polygons the last line to the first point is selectable. Fixed problem: The drawed grid use now the complete area. The crane overview in the options menu is renamed to object overview. The fleet overview is removed and replaced with favorite list. You can change the favorites in the Object overview (press F4 or select in the main menu Options). 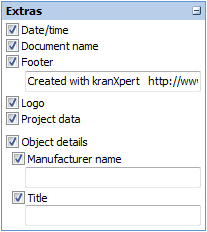 The extern tool kranFileEditor is now integrated to kranXpert, that mean you can edit existing cranes or create new cranes in the object overview. Own created or changed objects symbolized with . Hint: You can't edit objects with the book symbol! 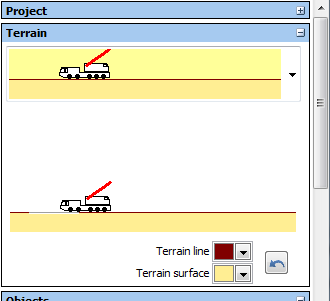 With the new editor you can create lorrys to use in the planner like cranes. Some lorrys you can import over the Install/Upgrade button. The tool extras is now editable. In the kranXpert setup folder extras\en you can change the HTML files by your own. The created PDF document has now better readable drawing and dimension text. In the print out the infomation about the jib is hidden when the main boom is selected. The active crane can now deleted without make first a other crane active. The last crane can now also be deleted. We add 'Skinning' support, with this you can change the look of kranXpert (main menu: Options >> Skin) . In the dialog windows we connect the ok button with the return key and the chancel button with the escape key. In the integrated webbrowser we add a print button. Importing cranes is now much faster. 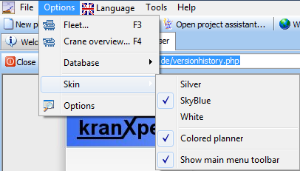 In the crane overview (main menu Options >> crane overview or press F4 key) you can import cranes directly without login to the kranXpert homepage by click on the 'Install/Upgrade' button then kranXpert loads a crane list and you can select the cranes you need or upgrade the crane. We add also the function 'Send crane request'. If you want open the help file and the help file not exists then you get a error message. In the menu help we add weblinks to our kranXpert blog page and to the kranXpert facebook group. The using of kranXpert on a network drive is now much faster. The load information panel is enhanced. In the first row (calculator symbol) are the calculated load capacity and in the second row (chart symbol) are the load information from the chart table. We add also a precent calculation from the maximum load / current load capacity. When you open a planner file and a crane in the planner is not in the current crane database, kranXpert ask you that he wants to install automatically the crane for you. The automatically import can fail if you insert the crane by youreself or is a crane from a 3th party member. In the rigging setup window: the rigging rope length and outside angle are displayed and you can also change the length/angles. In the planner file we store now the ground plan pictures and background images (and not only the link to a image file). Drawed text can now have different colors (previous version only use black). In the front view we fixed the problem when a crane have an y-offset the crane radius was on the wrong position. We add a new tab to the 'Three Views' view that you can see the load capacity table. The selecting of drawing items is now better. We change the groundplan picture setup window and add a better mouse selection for the dimensioning distance length. The tipping load information is removed from the printer output. The percent calculation from the maximum load capacity to the current load is on the printer output. When you select the 'Three Views' you can select to print with the load chart table or with the helping view. You can print the new 3D view. You can create pdf documents without a installed pdf printer. Added UNIC Minikrane support (spider outrigger and short jib with fixed hook). Added set the load type in the project assistent. In the welcome window on the update panel the click on a link open the extern browser to fix the bug that with closing kranXpert the download stops. The dimensioning lines draw with width 1 pixel (remove change the line width). The dimensioning arrows color use now the selected line color. In the rigging window you can insert minus values to set the rope outside the load object. The graphical user interface adjust to the use of netbooks with minimum 800x600 and maximal 120 dpi. 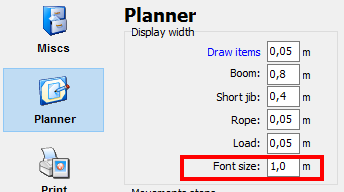 The input of the load size in the project assistant assign now again correctly to the planner window. Some words of the spanish translation changed. 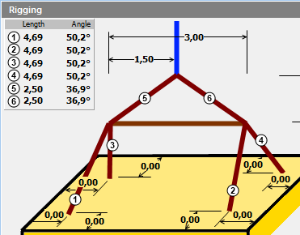 Added support for colored suspend counterweight load chart tables (needed for Liebherr LR 1600-2). The suspend counterweight show in the planner as 'Variable' and right on the suspend counterweight selection combobox display the weight. If the crane have no outrigger load information the info panel shows -.- kN (old 0.0 kN). If a view is active you can zoom with the + or - keys. If you press the pos 1 key the active crane is centered to the view. With the page up/down keys you can lift up/down the load (CTRL + arrow up/down is the same). (1.2.7.0) Added spanish language (thanks to Bernat Pons from Menorca for the translation). 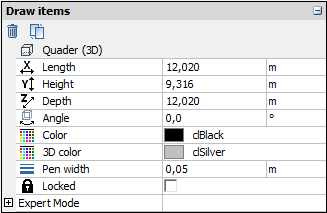 (1.2.7.0) Added support for colored counterweight load chart tables. The counterweight show in the planner as 'Variable' and right on the counterweight selection combobox display the counterweight. (1.2.6.0) In the options now the drawing element width has metrisch/imperial unit input. (1.2.6.0) Added in the options the load and rope pen width. (1.2.5.0) Added new tool crane compare. (1.2.5.0) Added telescopic jib boom. (1.2.5.0) The unit of the outigger load can now be variable not only kN. (1.2.5.0) Fixed problem that don't open the help file. (1.2.6.0) Added presentation of SL,SSL,Y,MegaLift. Cranes have to import. 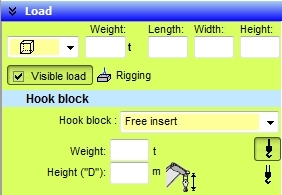 (1.2.6.0) The minimum hook distance (height 'D') can input in the free hook block insert. (1.2.6.0) The hook now displayed. (1.2.6.0) At the free hook block insert you can select one ore two rope display or when you select a hook block the view changed by the rope count of the hook. (1.2.6.0) The load visibility can changed. (1.2.6.0) The pen with of the drawing elements are changeable. (1.2.6.0) The file KXPAnsi.dll is now unused. (1.2.5.0) The info panel has changed and added the load OK symbol. (1.2.5.0) The backgroundplan picture supports now metafiles (wmf,emf) from the clipboard. Added a database information window (Options - Database - Info). Add a web browser where display the versions history and hompage of kranXpert. In the integrated web browser when you click on an *.kran or *.kranX file, kranXpert ask you for importing. At the network version the accept button at the beginning is disabled unless the network service give the OK. If exists a connect problem at the network version to the licence server now it show a error code and error group message. At crawler cranes the outrigger width can now used for the chain extended. Added working area 180� to the back. In the crane overview now the crane pictures show like in the crane selection window. 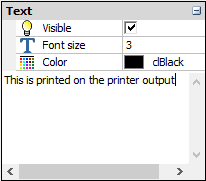 In the print preview added a button for changing the print options. Fixed a bug where in the left view the ground plan picture not moved correctly when the crane position changed. Added in the menu the different add versions to insert ground plan pictures. With pressed space key in the planner you can move the view like the hand symbol. Ground plan pictures now drawing with GDI+ (better scaling view). The superstructure rotating radius can now set visible/invisible in the planner. A own superstructure rotation radius can be insert and set visible/invisible. Added the crane radius shown in the top and views with changing colors. Comboboxes with more than one items have now a colored background. With this feature you can see without drop down the combobox if you can change a crane configuration. When the database 'kranxpert.dat' is read only, kranXpert display a message in the main window on the bootom right corner, also the creating of a fleet crane is deactivated. 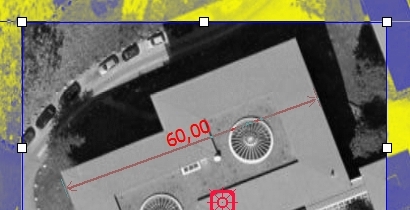 kranXpert have now a twain interface for scanning ground plan pictures from a scanner. In the ground plan picture edit window the picture can now rotate. 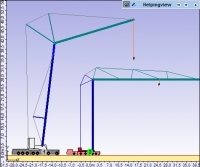 The project assistent select now the right cranes with jib/extensions. You can open the version history of kranXpert in the main menu info (need internet connection). 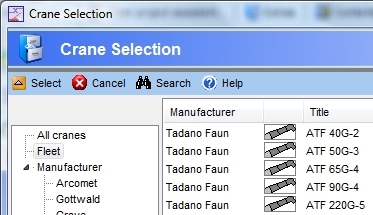 In the crane selection and crane overview window the display/selection has changed. This kranXpert version supports a better display for superstructure, couterweight and drivers cab. 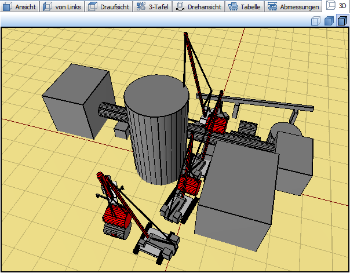 Now we must change the existing crane dimensions and later we make a database patch. In the welcome window now exists the project folder tabsheet that display the project files from the default saving path. In the ground plan picture setup window now you can set view margins to the picture. The ground plan picture can insert from the clipboard. In the crane options window at terrain offset and wheel offset there edit boxes. Fix the problem for printing the crane dimensions with wrong dimensioning size. 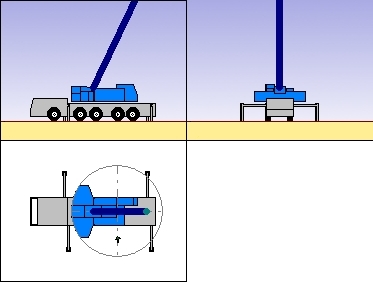 Fix the position problem by drop down the load at self erecting mobile cranes. The zoom factor changed from 10m to 5m. Dimensions, arrow and tape measure the arrows show all the same size on zooming. The helpfile now starts with the installed OCX-Lib. In all numeric text boxes fix the selection decimal seperator problem. 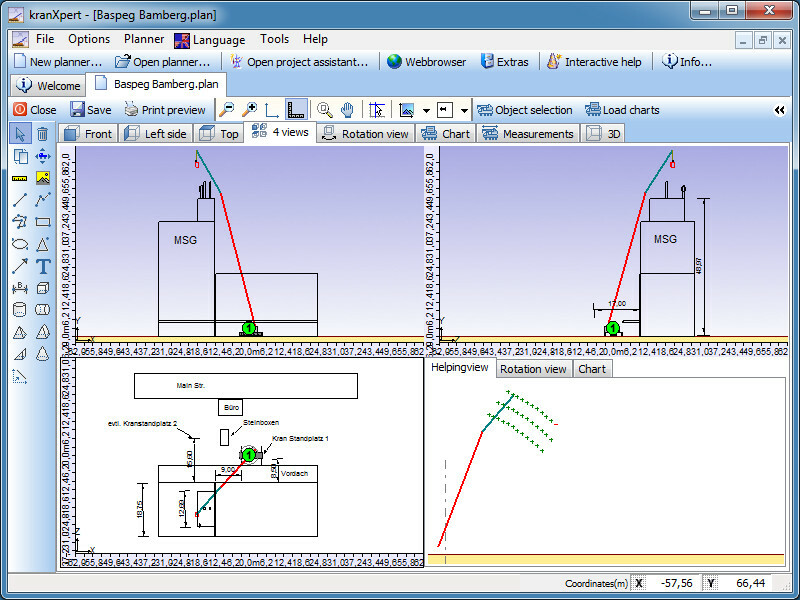 In the 3d drawing element window on height, width and depth textboxes show the direction X,Y,Z. 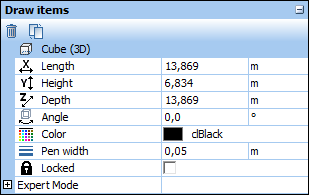 In the 2d drawing element window now you can insert the diagonal length and the with and height calculated. In the ground plan setup window, in the small overview picture you can now move the current view. In the ground plan setup window the view move, when you drag drop the dimension distance or the zero crane position symbol outside the view. The working area '270�' now displayed '270� to back' and '90� to front' added. 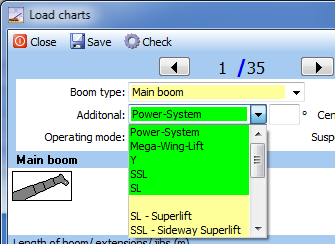 The mainboom extension length on the boom type 'hydraulic jib under load' now correct. 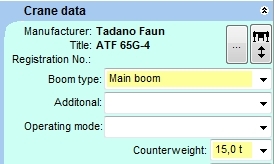 In the print preview you can now change the text or unvisible the crane title or manufacturer name. The drawing class was completely redesigned. The register program connection use now internal the internet-explorer. In the print preview now you can invisibly the crane informations. www.matusch.de integration EPOS commands. EPOS can now send messages to open/close planner documents and will notify from kranxpert when dokuments closed or saved. Licens files LIC and LIX moved from UserProgramData to CommonProgramData folder. Network version copies now the help files to the CommonProgramData folder. All default message boxes replaced by an one form, thats replace the bug that where only german language displayed on default boxes. In the helping view, now the load chart points changed to red dash at overload and green plus for ok. The crane database and the folders data and background now in the CommonAppDataFolder (not in network version). Under VISTA no normal person have rights to modify data in the programm installation folder. 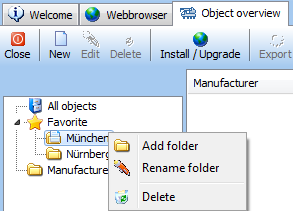 In the programm info dialog now shows the different programm folders. In the welcome window now you can search in the last open file list for a project. Percent zoom removed and substituted with move view (hand-symbol or with ruler move). 3D-objects move in left view fixed. Now no element is drawing outside the picturesize on printpreview and printing. You can now copy all views to the clipboard with the right mouse button, thats make be able to add the view to word/excel documents or to graphic applications. In the print preview now you can move the view by the new added arrow buttons. Now drawing elements move in the height with more cranes on different terrain height when you move the crane or activate crane. Ball/Cone/Cylinder fixed in the rotation view. The fileexplorer at welcome window shows now the project informations.